What else can the international community do for Venezuela? At the end of March, when Venezuela’s Supreme Justice Tribunal (TSJ, Supreme Court) handed down two judgments that disregarded parliamentary immunity and declared that the TSJ would assume the powers of the National Assembly, Venezuela’s crisis entered into a new phase. This manifest disregard of the Constitution has managed to generate a strong international reaction. A majority of countries in the region have turned their attention to Venezuela. This attention is now evident through recurrent press releases and specific decisions in Mercosur and the OAS – an organization that the government, in retaliation, has begun the process of exiting, but that will not formally be effective until April 28, 2019. However, the conflict still seems to be far from a resolution while the tension, repression, and number of deaths increase. In just a month, thirty-five Venezuelans lost their lives as a consequence of violence. Faced with these realities, the question arises whether the international community is doing all that it should be doing or if, on the contrary, it can take further actions to try and influence the end of the tragic trance facing Venezuela. Everything indicates that diplomacy can still have a significant impact, even though the key will always be in domestic dynamics. Specifically, the region must try and propose a concrete solution to end the crisis that is sufficiently attractive for both the regime and the opposition. Setting aside inaction, it can be said that there are six diplomatic tools available when faced with an internal crisis like the one in Venezuela. Whether in an individual or joint way, countries can: (i) consult and/or discuss; (ii) issue declarations or press releases; (iii) limit or cease diplomatic relations; (iv) present proposals for possible solutions to the internal actors; (v) mediate or act as guarantors for negotiation processes, and (vi) impose sanctions on government functionaries or the country’s economy. Throughout 2016 and with the opposition’s efforts to bring about the recall referendum, it became evident that most of the region was mainly focused on using discussion as a tool for change, and in some cases, statements or press releases were issued. The fundamental change after the TSJ rulings has not only been an increase in the attention paid to Venezuela and the number and frequency of press releases but also that several countries have shown themselves willing to take diplomatic actions. 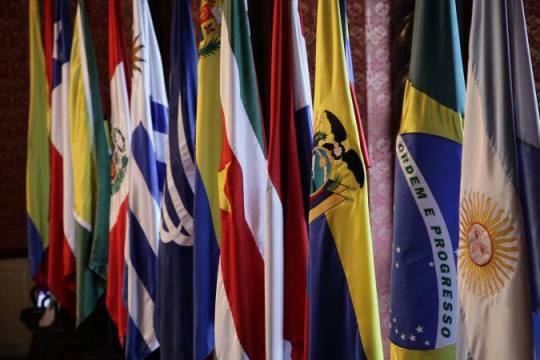 The decisions made by Mercosur and the OAS at the beginning of April are good examples, but countries such as Peru and Chile have also taken unilateral actions, such as permanently withdrawing their embassies from Caracas. Therefore, it is very likely that, if the situation continues to worsen and Caracas stands by its announcement to withdraw from the OAS, more countries may take bilateral actions. These could be calls for meetings with the Venezuelan government or the withdrawal of ambassadors from Caracas, or a withdrawing recognition of the legitimacy of the Maduro regime, and the end of diplomatic relations. In fact, Costa Rica has called its charge d’affairs in Venezuela for consultations. These alternatives are relevant, as a majority of countries understand that organizations such as MERCOSUR and the OAS have already put into practice the first phase of their democratic clauses, and, at the same time, there doesn’t seem to be enough desire at the moment to suspend Venezuela from these organizations. The reason there is a reluctance to suspend Venezuela from international organizations is that many countries think this would simply isolate the government even more. The majority of the region prefers that respect for the Constitution is reinstated, an electoral calendar is defined, and that Venezuelans themselves reach an agreement regarding how to exit the crisis. Thus, taking into account that some countries have recognized that the call for a “constituent assembly” is an attempt to “plow through” on the part of the government, the fourth tool could be particularly useful and relevant. The countries of the region must try to put forward proposals, concrete solutions that are attractive enough for both the regime (or at least a sector of it) and the opposition. In fact, this idea has already been hinted at in a recent press release by eight countries, even though it is not expressly recognized that for this “inclusive national agreement” to be finalized it would take not only pressure but also international aid and advice. As several countries have recognized, this proposal must include the re-establishment of respect for the Constitution, the recognition of the legitimacy of the National Assembly, and the definition of an electoral calendar. In this environment, holding regional and municipal elections in 2017 may be attractive to both parties, while the presidential elections are left for December 2018, as this would correspond to the constitutional time frame. It is clear that this is not a proposal that is easy to sell or chew in the current situation. Evidence of this came from the former president of Uruguay, Pepe Mujica, when asked if he would mediate in the Venezuelan crisis. He firmly rejected the possibility saying: “As if I were a magician!” But the region must be very emphatic in communicating that, with a crisis of such magnitude, it is very unlikely and undesirable that either the government or the opposition seek victory in the battle, especially taking into account that it could signify the loss of even more Venezuelan lives. This all could lead to a fifth tool, with at least one group of countries or some international organization mediating or acting as guarantors, a negotiation process may take place and agreements could be reached. The idea of forming a group of countries that are directly dedicated to trying to help resolve the situation has already been proposed by countries such as Peru. Likewise, the Argentine government is now holding consultations with the Bolivian government to encourage it to work to convince Nicolas Maduro to abandon the idea of a “constituent assembly”. Taking into account what has been previously said, it is necessary to recognize that recent history and what has occurred during the month of April suggests that Nicolás Maduro’s regime has radicalized and does not seem willing to listen to any proposals from the region. This radicalization has been confirmed with the supposed call for a “constituent assembly”. It is in this context that we have to consider the sixth and last tool that the countries could have available: sanctions. This is a controversial issue. Some people, like members of Congress and ex-officials of the U.S government, consider that a policy of sanctions against certain officials of the government or even regarding the economy (for example, a decision to stop buying Venezuelan oil) could prompt a resolution to the crisis. On the other hand, it is also logical to think that sanctions are unlikely to be effective. The paradigmatic example is Cuba. History demonstrates that the commercial embargo placed by the U.S did not fulfill its objective of generating a change of regime on the island. The situation in Venezuela is partially analogous to the one in Cuba. Firstly, because the regime has also dedicated itself to the promotion of an anti-imperialist sentiment. If the sanctions are imposed by the U.S, this could end up backing up the government’s anti-imperialist rhetoric. Secondly, because the only country that has shown itself willing to impose sanctions is the U.S. Usually, the effectiveness of sanctions loses strength when they are applied only by one country and the reality is that in the rest of Latin America there does not exist a practice of imposing sanctions, but rather of rejecting them. This has been recognized by the former ambassador of the U.S in Venezuela during the government of George W. Bush, Charles Shapiro. Likewise, for now, the possibility of the European Union imposing sanctions on Venezuela seems unlikely. Europe is going through a complicated time, and their attention is focused fundamentally on their neighborhood. Third, it’s hard for sanctions to generate a transcendental effect if they do not create the incentives for there to be a change in the behavior of the people or countries sanctioned. What the sanctions of undefined character accomplish in some cases is an increase in the risk of a change for the officers associated, which is why these individuals end up radicalizing themselves faced with the danger of losing power and possibly being subsequently judged. However, it is also true that a policy of sanctions could encourage officers that have not yet been sanctioned to think twice before committing human rights violations. Yet, in the case of Venezuela, the sanctions that have already been imposed by the U.S government have not been substantially effective if we compare the increase in episodes of repression and the role that sanctioned officers continue to play. So can the international community play a more relevant role? Ultimately, the international community–and especially the countries of the region–can play a more relevant role. There are still diplomatic tools that can be used to push for a solution to a crisis that is causing the deaths of many people. At this point, the best option might be for an important group of countries to present a concrete proposal, laying out possible exit plans that are attractive to both the opposition and the government. In the end, it is clear that the solution to the situation in Venezuela depends on Venezuelans. However, the region must exhaust every resource to try and help, before it is too late. *Mariano de Alba is a Venezuelan lawyer specialized in international law and foreign affairs. He holds a Master in International Law from Georgetown University, tweets at @marianodealba and writes for Prodavinci.com about Venezuela and the international community.